44 C: it prints out the identification of occupied exchange switches, and failed switches. 44 E: same as 44 C, but simultaneously prints the status messages at a remote T.empf.39 printer at the next upper-level telephone exchange. Therefore, and unlike model 44 C and F that are printer-only, model 44 C is a printer/sender and operates with the start-stop system. 44 F: prints status data from Prüf- und Alarmregistriereinrichtung system (PAR; test & alarm-recording) of private branch exchanges (PBX), such as the Siemens ESK-3000E. Note that unlike all other Siemens-Hell models, its only model designator appears to be simply "44", not T.empf.44, T.typ.44, or T.send.44. Possibly, because it is neither a printer-only model ( = T.empf), nor does it have a keyboard ( = T.typ), nor is it a sender-only ( = T.send). 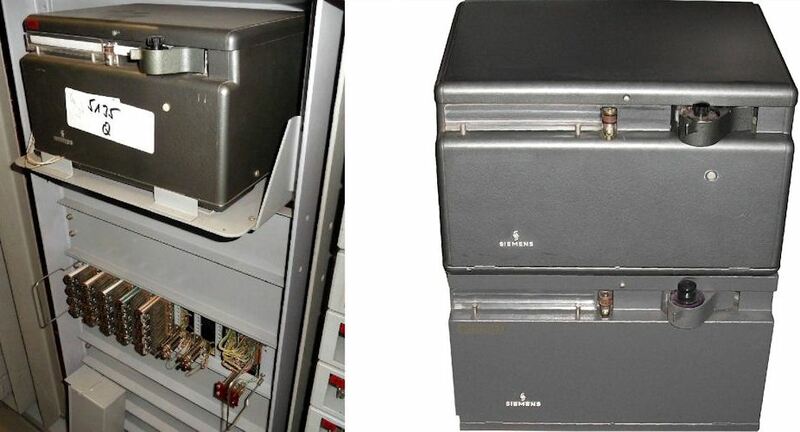 Through the mid/late-1960s, the housings did not have straight comers as in the photos above, but rounded corners, as in the photo below. Model 44 E sends the 7x14 Hell-font with start pulse. 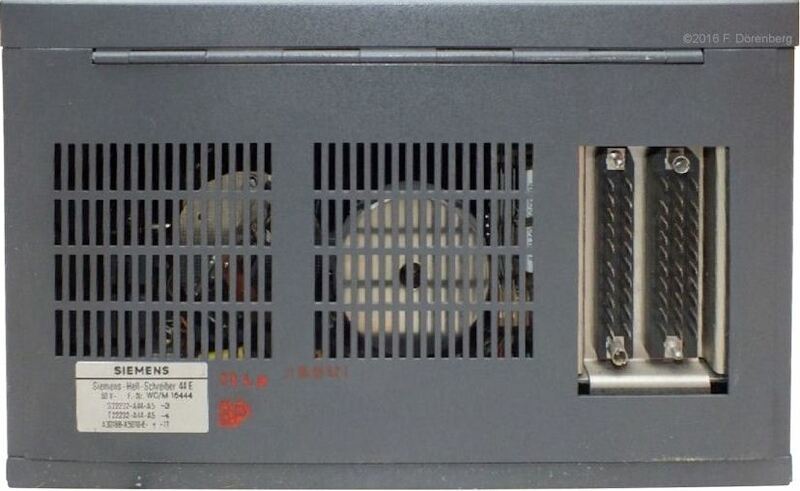 Model 44 C and E have an internal exchange switch, connected to the pins of blade-connector St2 ("Stecker 2") on the rear of the unit. Model 44 F sends the pulses to a chain of external exchange switches ("Zählerkette"). It does not have an St2 connector. In model 44 C and E, the character pixel-pulses are sent to the test equipment via St1 ("Stecker 1") on the rear of the unit. they are wrapped-back via the test equipment, and then go to the printer module. In model 44 F, the pixel-pulses go directly to the unit's printer module. Remote control: only model 44 E is connected to a remote T.empf.39 printer. In case of an alarm or detected fault, the test equipment "wakes up" the T.empf.39, waits for the "ready" ("Bereit") back from the T.empf.39, then activates the 44 E.
Model 44 C and F: no speed regulator; speed adjustment simply with a variable series-resistor (potentiometer). 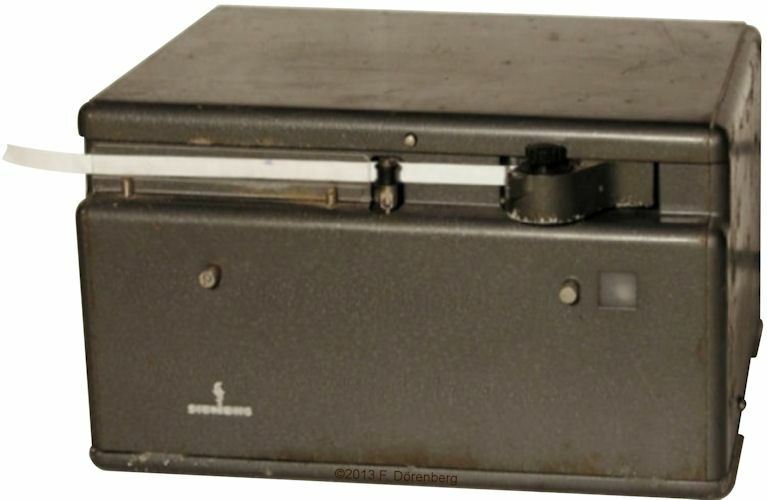 Model 44 E. centrifugal speed regulator, with speed adjustment knob under the lid of the unit, next to the roll of paper tape. The 44 E needs to maintain the nominal speed better than ±2%, as it also transmits to a remote T.empf.39 start-stop printer. Power: all models were available in versions for 48 and for 60 volt DC operation. I.e., the world-wide standard operating voltages of telephone exchanges and systems. Power consumption: ca.35 watt. Size: 32x26x20 cm (WxDxH, ca. 12.6x10.2x8 inch) - same as the T.empf.39 and T.empf.40. Figure 5: Front of model "44 E"
Figure 6: Rear of model "44 E"
Ref. 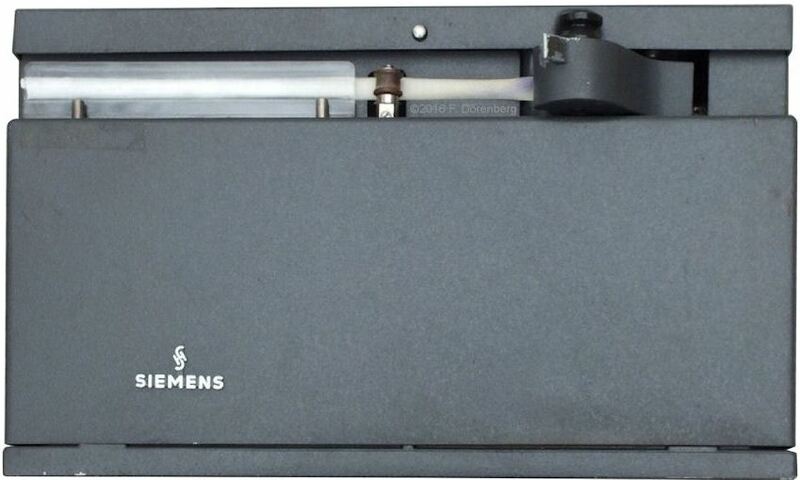 1: "Siemens-Hell-Schreiber 44 - Beschreibung", Siemens AG, Bereich Fernschreib- und Datenverkehr, A22232-A44-A3-1-18, Ag 02730.2, December 1972, 23 pp.